It’s “10 Prayers Tuesday”. Thank you for joining us during our Summer in the Secret Place at Prayer in Every City. As I have studied the book of 1 John this week, it has led me to John 15, which is the story of the vine and the branches. I have written these prayers so that I will bear the fruit that God desires me to have for my life. You can print a copy of these prayers and add them to your Family Photo Prayer Journal. To find our more about making a prayer journal click here: Family Photo Prayer Journal or click on “Prayer Journal” at the top of the page for a pull down menu. I have a quick trivia question for you. 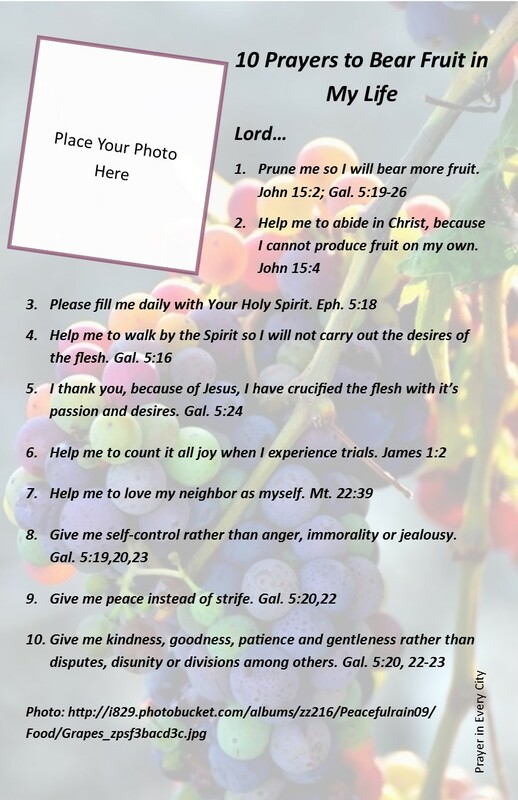 How many fruit of the Spirit are there in Galatians 5? If you guessed one, you are correct. 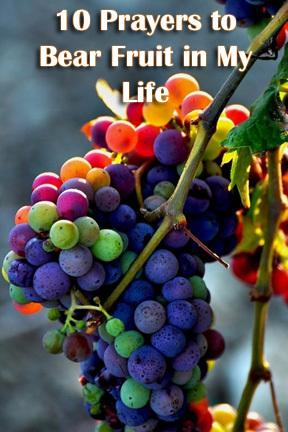 I realize that there are 9 characteristics listed, but the word fruit in this verse is singular. The Greek word for fruit in Galatians 5:22 is karpos, which is singular here. So I guess you either have the Fruit of the Spirit or you don’t. We will pray for you. Keiljo. Thank you for reaching out to us.